Back in Business: Diana Thompson (left) with son Travis and his partner Jodie. Photos: Alex Rea. Braidwood now has an extra shine. The heritage-listed town has long been known as the jewel in the crown of the Kings Highway, but now Braidwood is really sparkling with the arrival of the Thompson family jewellery store in the main street. 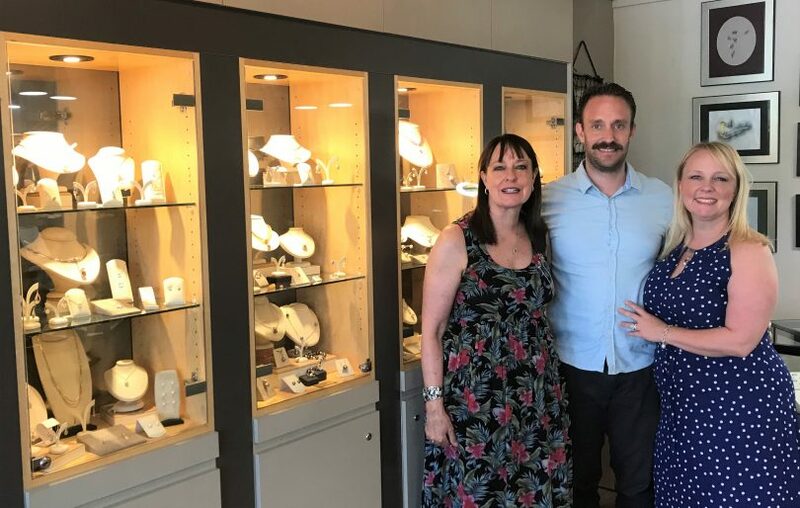 Having closed their famous Manuka store ‘Briolette’ last year, Diana Thompson, son Travis and his partner Jodie have opened ‘Thompson Bespoke Jewellers’ just a few doors up from the Braidwood Bakery. 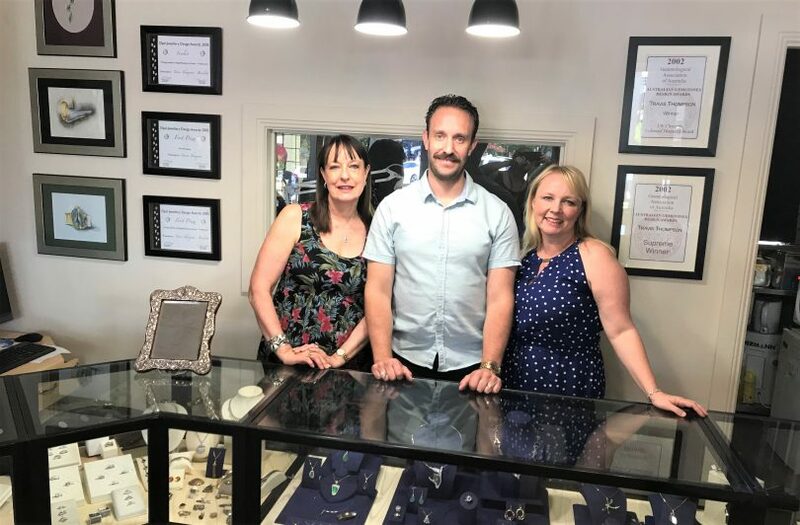 With Diana’s son Travis and his partner Jodie closing their coastal jewellery shop and moving to Braidwood, the decision was made and ‘Thompson Bespoke Jewellers’ was born. 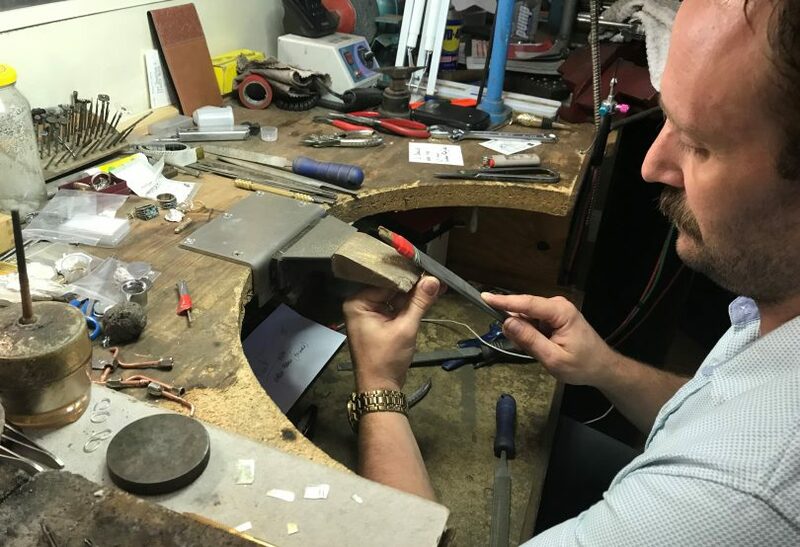 It is a family business concentrating on handmaking, remodelling and designing using Travis and Diana’s award-winning design skills and his award-winning work from the bench. Diana says, “The beauty of being in Braidwood is that the costs are so much lower than Canberra and so this is reflected in the pricing. Beautiful one-off handmade pieces will be 15-18 per cent less for the same quality. The family have lived outside Braidwood for decades and commuted into Canberra to Briolette. “We have had the farm for 37 years and have lived there full time for the last nine years, although by Braidwood folklore we would still be considered blow-ins,” said Diana. Diana has been in the industry for 32 years and Travis has been at the bench for 20 years. Jodie is new to jewellery, but with a background in fine art and ceramics brings a fresh look with her designing skills. Travis Thompson working on a piece at the new Braidwood store. “It’s always better to spend a little more on a piece of quality jewellery which is designed and made to be worn and enjoyed for many years, than waste money on thin, poorly constructed pieces,” says Diana. The store opened quietly just prior to Braidwood’s Quilt Event weekend in November, and they have been so busy that there hasn’t been an official opening yet. The town has a rich history of artisans and silversmiths. In the 1970s, Austrian silversmith Christophe Altenburg opened Studio Altenburg and nurtured a talented group of artists in the town. Now celebrating its 40th year, Altenburg & Co continues to showcase local artists. William Verdon Manufacturing Jewellers has also been on the main street for many years, and jewellers Laura Miers and Luke Robinson’s opened the Mr. Concept Store 18 months ago. Other local silversmiths include Paul Bott and Charleys Forest Silver. Thompson Bespoke Jewellers are open seven days a week during the summer period. The Thompson Bespoke Jewellers team: Diana, Travis and Jodie. Original Article published by Alex Rea on the RiotACT.